Student protesters at the University of Missouri-Columbia in November. College students have for weeks led protests over race relations on campuses across the country after well-publicized confrontations at the University of Missouri and Yale University. Although much of the coverage has focused on calls for resignations of top college officials and the renaming of buildings that honor divisive historical figures, the student groups are seeking much more. 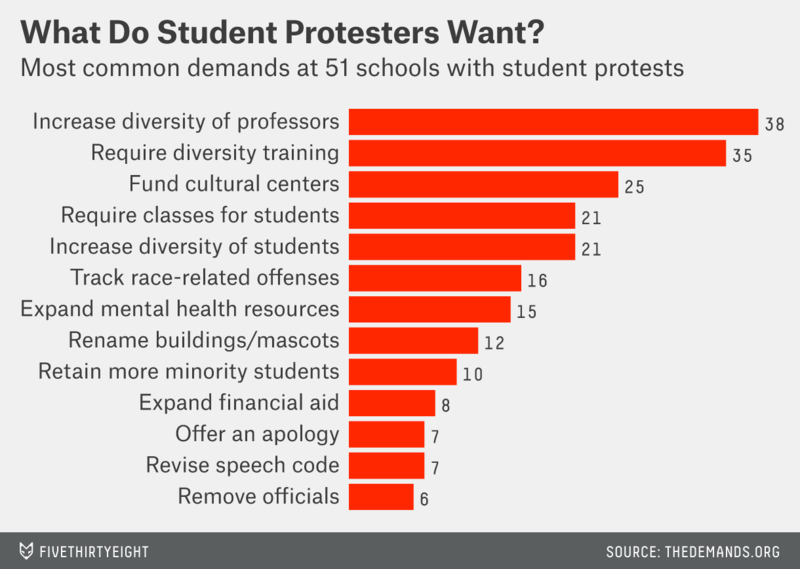 The most common demands, according to our analysis, have been for schools to increase the diversity of professors, offer sensitivity training to students and faculty members, and create or expand support for cultural centers on campus. The demands at more than a quarter of these schools (14) included a deadline by which school administrators needed to agree or respond, or else face escalations of protests. Hiring more minority professors was the most commonly cited goal (38 of 51 schools), but students offered a variety of ways to measure diversity. Three student groups called on their schools to keep hiring until minority professors made up the same share of the staff as minority students did of the undergraduate population. At one school (Missouri State University), students demanded that the proportion of black professors be equal to the proportion of black Americans. Groups at seven schools specified that diversity should be gauged by looking at the demographics of tenured and tenure-track faculty members, not just teachers overall. And students at two schools (Eastern Michigan University and Emory University) specified that professors in African and African-American Studies departments should be excluded from the overall calculation to prevent their schools from meeting quotas by concentrating hires in those departments. When students requested diversity training for students or additional required classes, their demands were often phrased as extensions of existing university programs. Several manifestos compared diversity training with sexual assault/harassment prevention training, which their schools already required. New required classes were often proposed as an expansion of the school’s existing core curriculum or graduation requirements. In one case (Sarah Lawrence College), a new class on race was proposed that would be mandatory for graduation but ungraded. Students at 16 schools asked for better data collection and transparency as part of their demands. The most frequently requested data (six schools) was for a survey on the atmosphere in classrooms that would collect information as part of end-term evaluations on subtle forms of racism, often called microaggressions, that are committed by specific professors and lecturers. The second most commonly demanded data was campus climate surveys (four schools). At New York University, students demanded an anonymous Web forum “that would be visible to the whole university” in which they could report and discuss incidents of racism as a way to limit feelings of isolation. Students at two other schools (Emory University and University of San Diego) specifically requested that Yik Yak, a popular cellphone app used to share stories anonymously on campus, be banned from use or that the school request that the app implement a geofence preventing it from being used on campus. The manifestos also included a range of demands that were less directly linked to race. Yale students called for the school to help students receive dental and ophthalmology care. Students at Grinnell College and the University of North Carolina at Chapel Hill demanded that their schools divest their investments in private prisons. Students at Brandeis University, UNC-Chapel Hill, and the University of North Carolina at Greensboro demanded that their schools raise the minimum wage that they paid. These kinds of demands were usually framed as intersectional approaches to justice, with one marginalized group using its leverage to help another. When a document did not include a date or any citation of recent events, such as a mention of the University of Missouri, it was included, but any document with a date earlier than fall 2015 was excluded. Two schools were excluded because the links to their manifestos on The Demands website were broken.